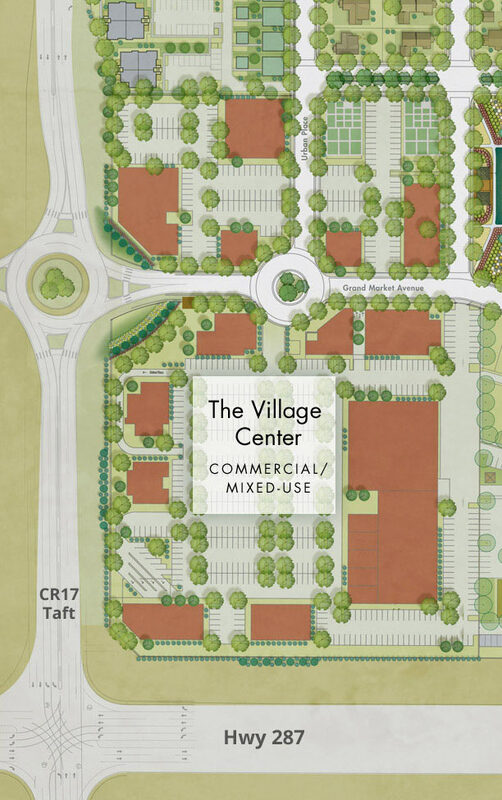 The Village Center is the commercial hub of PrairieStar, and includes plans for a grocery store, restaurants, commercial office space, and a variety of retail shops. This vibrant public space is the core of community activity, accommodating transit riders, pedestrians, motorists and cyclists. PrairieStar’s Village Center has a current traffic count of 35,000 daily vehicles trips, and a projected 52,000 when built. The commercial area consists of up to 228,000 square feet of retail and office space, including locations for a grocery store, a Starbucks, a bank, and restaurants. At the southeast corner of the intersection of 287 and County Road 17, PrairieStar has an approved site for a 10,000 square foot gas station/convenience store, too. * Exact sizes & uses will be based upon market conditions. © 2019 PrairieStar, Berthoud, Colorado.